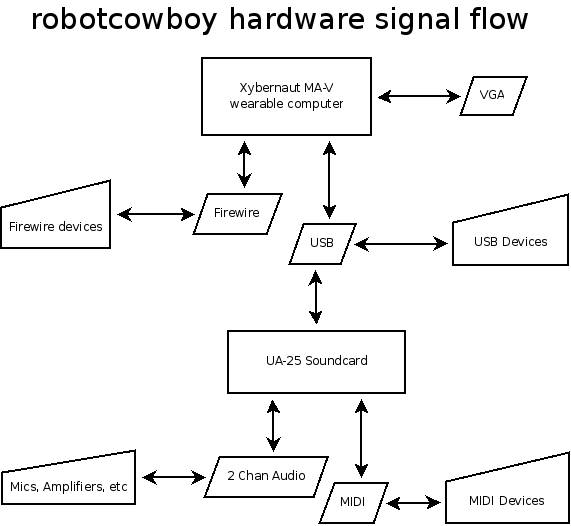 The main hardware of the robotcowboy system is a wearable computer. Why a wearable and not a laptop? Laptops are not specially designed for live performance, they are general purpose computing machines. Wearables, obviously, are designed to be worn and, at least for me, this adds a great deal to the instrumentality of my system. I have mobility along with flexible computing and do not need a screen … screens steal attention from the show. All of this is an experiment in the nature of live performance using computers. 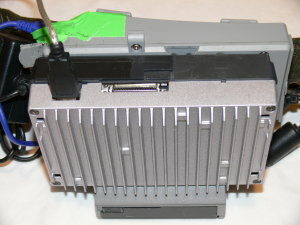 The computer is a Xybernaut MA-V from 2003 and is no longer in production. It was originally intended for industrial use at warehouses and workshops, but the market for wearables has essentially disappeared due to cellphones and wireless tablets so you can find them on ebay. I bought this one for about $300. It is a 500MHz low voltage Pentium 3 with 256 MB of RAM and an 8MB Ati video card. I replaced it’s original 4GB ipod size (1.8″) harddrive with a 15 GB solid state (Flash) drive so I don’t have to worry about the drive crashing while I dance about. The batteries last about 2-3 hours but I don’t trust them as they are old and usually play on AC with the power brick strapped to my belt. There is a 6″ flat panel touch screen, but I do not use it live, only as backup if anything goes wrong. The computer is the metal box strapped to my right side. 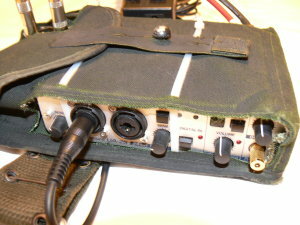 A Roland Edirol UA-25 USB external soundcard provides a stable computer audio and MIDI interface. It’s built in a durable metal case and has high quality connectors even though it’s relatively cheap, around $250. Coupled through a Behringer direct box, all I need is 2 XLR cables to plug into any PA system. Both the direct box and soundcard are mounted inside a case strapped to my belt on my left side.